Not only are dogs jumping on you generally annoying, it can be dangerous for people who aren’t as steady on their feet. It can make people very mad at your dog. Since dogs don’t use the same language we do, they cannot communicate with us in the same way. So we have to look at their actions and behaviors as their method of communication. If you have ever seen two dogs when they meet, they greet each other face to face, unless there is a massive size disparity. So, why are we surprised when that is how a dog wants to greet us? You come home from work and let your dog out, and they are excited to see you and excited to show you how much they have missed you. So they jump up on you to get closer and give you some love. To stop this type of jumping, you need to be prepared before your dog is let out or gets to you. Your dog will take his cues from your body language and how you start the interaction. This means there are two ways to go here: do you want your dog to be invited to jump up, or do you want them to keep all four paws on the floor? If you want your dog to jump, you have to work on that when he is less excited. The good thing is that it is usually pretty easy to get most dogs to jump. Be prepared for either an awkward look from your dog that says, “Dude, you don’t usually want me to jump on you. Is this a trick?” Or, a full four paw jump, because they are so excited you finally understand their need to jump on you! When your dog has jumped up and is being a little calmer about it, verbally praise them and give them a snack. Then, in a clear and strong tone, tell them, “off,” while moving into them with your body (not pushing them off with your hands). If they come back to jump on you again, say, “off,” and move into them again. If they refuse to listen to that, step on the leash so that they are not able to jump up. Continue to repeat this 2 or 3 times during each training session, a couple times a day until they understand both “hug” and “off." As your dog is approaching to jump, move towards and lean your upper body over your dog as you say “off." If your dog does not respond, then practice this when he is calmer. Also, work on respect exercises and training. Use your leash by stepping on it, so that your dog doesn’t have the space to jump on you until he calms down. Work on the above steps of teaching a command to jump up so that your dog understands that there is a difference. Sometimes teaching a command to do an annoying behavior is exactly what will make them stop. Since dogs don’t have language skills like we do to work out issues, they have to figure things out in a different way. They do that with their body language and space usage to work out pack rankings. Determining if this is your dog is a little more complicated, but it is often seen when your dog isn’t very excited (or that there isn’t much of a reason to be excited). This is more than likely to happen when you are in their way or have something that they want. They will usually jump on you and try to push you backward more than just jumping up to give you kisses. Often times they will jump on you and try to hold on when you push them away or try to move into them. Sometimes moving into them may elicit a growl because they want to back you off. Jumping to establish control is a different thing from an excited dog just trying to say hello. This dog is showing you that he does not respect you, and that he believes that you don’t need to be listened to. So the work needed to stop this behavior is all about building respect and doing a bit more training. The first thing you need to do is calmly accept what your dog is telling you, and decide today to make a change in how you interact with your dog. Please note: if your dog has growled at you or tried to bite you when you move into them, please seek professional help in your area to help solve this issue. Make your dog Wait at every doorway and threshold you cross so that you go first and claim the territory. If your dog is one that always wants to dart through first, use your leash to stop them. Have your dog sit and wait for his food before he is allowed to eat. Start working on backup, where you move into your dog and have them back up from you. These items take time and practice, but your dog will respond if you are consistent and dedicated to making the change. This type of jumping is the one that you need to pay attention to the most in your life with your dog. If you have a dog that rarely ever jumps on you, and all of a sudden they jump up and put their paws on you, it may be time to pay close attention to your dog. If a dog is stressed or afraid, their demeanor and typical behaviors will change. If you see this in your dog (or really any dog you know) you should step back and check on your dog. Are they hurt? Did a new dog come around they don’t know? Has the weather changed? Is it hot outside? When was the last time they had a chance to go outside to pee or poop? Look closely at your dog and figure out what kind of thing is stressing them. Please don’t dismiss their change in behavior. They have turned to you to beg for something and don’t know another way to tell you. You shouldn’t stop this type of jumping. You need to diagnose your dog's issue and remedy that. If your dog is just stressed being in a new situation, you should calmly get them off of you, offer them a treat to calm them down, and have them sit politely beside you until their stress level has subsided (or take them somewhere else so that they can calm down if it is taking a while for them to calm down.) But most of all, please do not just ignore this behavior change. Having a dog with poor social skills is a balancing act. It's about getting them to experience new places, balancing their stress levels, and just letting them experience new things so that they can get used to all of it. Dogs with poor social skills often times just don’t know better. They will bounce off of everything, jump on everyone, run around like crazy, and investigate everything they can get their paws, snout, and eyes on! These dogs can come from any background, whether a rescue or puppy from a great breeder; if they haven’t had experience in new places and new situations, this can be how they respond. A dog with poor social skills is one of the hardest dogs to stop jumping. They are like a 4-year-old at Chuck E. Cheese for the first time. They won’t be able to hear you or comprehend what you are saying because they are so overstimulated. So, our job is to redirect them and gently show them the right things to be doing. For a dog with poor social skills​, the leash is your tool of choice. Your job is to slow down this dog and get their focus back. Use treats if they will take them, to get their focus back on you. Using the leash, get your dog to do a few basic commands and start working for you. This will help center them and get some focus on a simple task. Take the dog away from the situation that is over-stimulating them. Once they have calmed down, bring them back into the situation, this time keeping them focused on you. Use the steps of an excited dog say hi to teach your dog “Hug” and “Off” so that they become second nature. 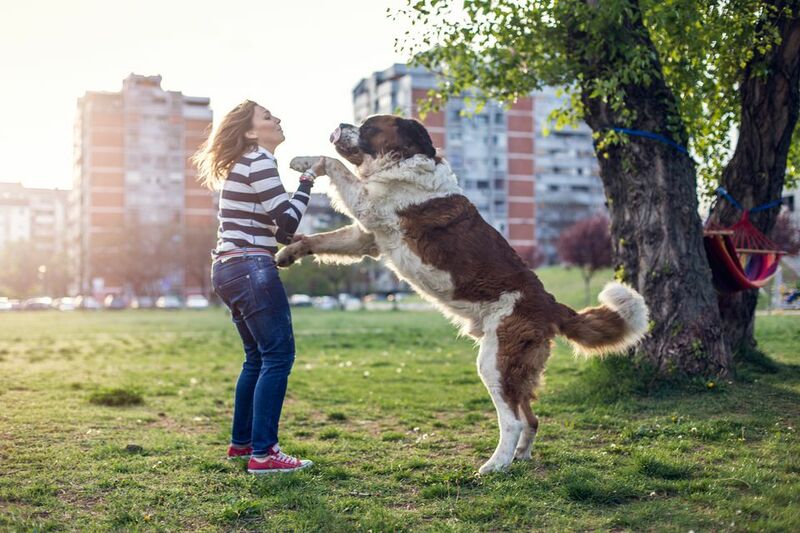 A dog jumping on you can be an annoying thing, but there are different things to look at to determine how to handle the problem.